THE CHEF and HER KITCHEN: Coin Sambar / Radish(Mullangi) Sambar.....with freshly ground masala!!! Coin Sambar / Radish(Mullangi) Sambar.....with freshly ground masala!!! Sambar is one of most important accompaniments in south Indian meal and it at least appears twice in our lunch menu.Sambar is made in various ways in different regions of south India,for example in Andhra,coconut is not added to sambar while in karnataka coconut is a must while making sambar.How ever I like and enjoy both the variations and do it according to my wish at that point of cooking.I usually get a pack of sambar powder for the whole year from my mom and still some times I will be out of stock,then I make freshly ground instant sambar which I am posting here.Every family has their own recipe for sambar powder and the one I m using is partially adapted from both my mom and MIL's versions and I can claim that it is my own version which works for me when I run out of stock. 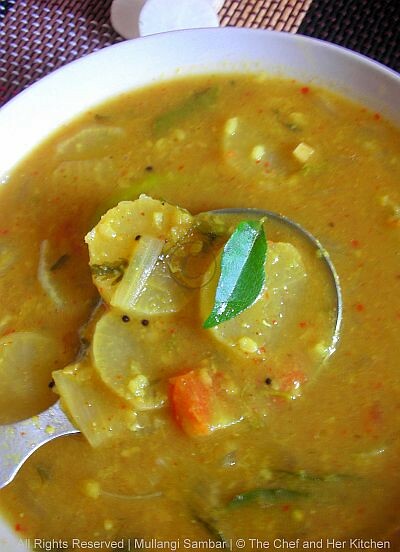 Sambar is made up of vegetables like potatoes, carrots, beans,cluster beans, drum stick, radish, brinjal, ladies finger, yellow cucumber, pumpkin, chayote squash, white pumpkin, bottle gourd and even greens.Every vegetable adds a different taste to sambar and among all the sambar varieties,I like drum stick , ladies finger and radish sambar as they impart very special flavor to sambar.We used to call radish sambar as 'Rupayila Sambar(which means rupee coin sambar)' as my mom used to cut radish into thin rounds which looks similar to rupee coin and hence the name.Here goes the recipe of radish sambar,this version is quite compatible you can make it as it is or you can even make it rich by adding coconut to the spice mixture,how ever both the versions taste good in its own ways. Wash toor dal and add a pinch of turmeric to it and pressure cook for 3 whistles.Slightly mash it after it cools down. Soak tamarind in water and squeeze the pulp and dilute it with water. Dry roast chana dal,coriander seeds,mustard,jeera,pepper corns,red chillies and methi seeds separately and grind it to a fine powder. Heat a tsp of oil and add diced onions,green chili and fry a little bit and add chopped tomatoes and let it become slightly mushy. Add radish rounds and fry a bit and add tamarind water and add more water, salt,turmeric powder, curry leaves, chopped coriander and boil until the radish is cooked well. Add freshly ground sambar powder and jaggery to it and boil well and add cooked toor dal and simmer well for 3-4 mins. Heat ghee in a small tadka pan and crackle mustard seeds,curry leaves and hing and fry little bit and add it to the boiling sambar and mix well. 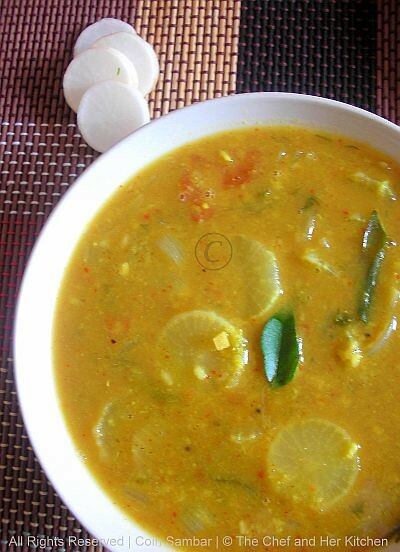 If you want to make this sambar for Idli/Dosa , add 1/2 cup toor dal: 1/2 cup moong dal and pressure cook and follow the same procedure.It tastes best with Idlis and dosas if moong dal is mixed with toor dal instead of toor dal alone. I sometimes add 1/2 cup grated coconut to the ground masala and add enough water and grind it to a fine paste.This gives completely a different flavor and taste to sambar. Addition of coriander leaves is optional,it tastes different with it and tastes good even with out it. You can replace radish with vegetables like potatoes, carrots, beans,cluster beans, drum stick, radish, brinjal, yellow cucumber, pumpkin, chayote squash, white pumpkin, bottle gourd and even greens. For a Vegan version avoid ghee and use oil in tempering. I love radish in my sambaar...and instead of adding sambar powder sometimes I too grind the masalas. This is so much inviting. Sambar looks great.that too adding raddish will enhance the taste. looks awesome, must be really flavorful with the addition of homemade ground masala! Comfort food that is what it is. I like your masala too! Must make it. Thanks. Love radish sambhar with papads, my fav..delicious and very inviting sambar..
Mulangi sambar looks awesome delicious. Sambar looks so wonderful and delicious !! 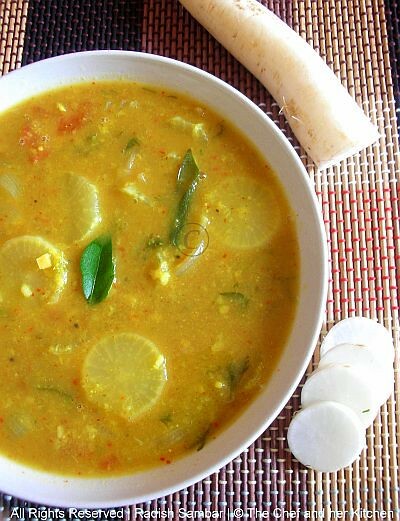 Love this radish sambar for its strong flavor and taste. Looks delicious. This just makes me drool...yuuuummm. Would be so good with rice..thanks for sharing your recipe..have a great weekend! Lovely sambar..Never tasted this before but i am sure it tastes fantastic..Will give it a try soon..Thanks for sharing..
wow..that's an interesting sambar recipe...loved it...awesome pics too..
Wow... So mouthwatering nice recipe. My all time favorite too. YUM! Mullangi is mostly made into a sambhar at home. Liked the name- coin sambhar. I love Radish sambar...And we too call it as coin sambar. Tasty sambar recipe,will have to try it out.